Pass along some inspiration with these Walt Whitman quotes. That blank card you grabbed at the pharmacy isn't destined to inspire anyone. Let the poetic insights of Walt Whitman elevate your correspondence through these beautifully designed notecards. The set of 12 cards features four different quotes. Whitman's words celebrate our potential ("Each of us is inevitable, Each of us is limitless.") and our better nature ("Some people are so much sunlight to the square inch. "), bringing a smile to each recipient. 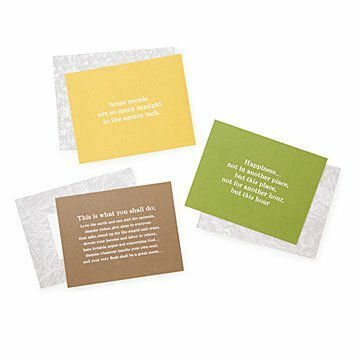 The quotations are presented elegantly on the front of each card (blank inside), while the corresponding envelopes are printed with breathtaking graphics evoking the leaves of grass that inspired Whitman's most famous collection of poems. Presented in a sturdy keepsake box, these cards might just make your mail carrier's day. Made in China.